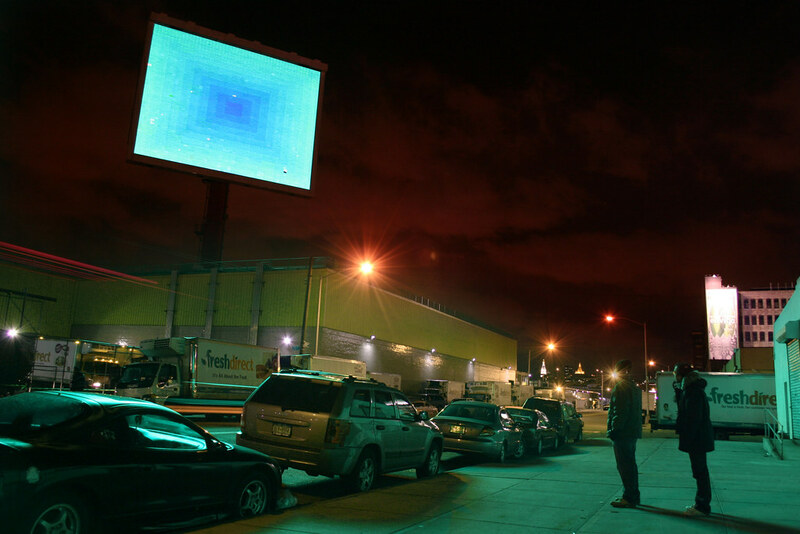 Color Shift produces an urban-scaled glow using the largest video billboard in the country. In the winter months Color Shift replaced the regular advertising feed of a billboard in New York with a rhythm of saturated colors. Programmed to “waltz” around the color wheel, the new output produced maximum saturated color effects from the LED lights of the billboard itself. The effect was felt on the neighborhoods around the sign, washing them in its changing glow. To some the noise of media in urban environments is associated with pollution — a tangle of lights, images, words and sounds. However, embedded in all media is the potential for orchestration, rhythm, and urban-sized effects. Color Shift is a project that enters this dynamic of large-scale media, and releases its internal RGB space out to the city around it.